Japanese Idol Assaulted by 2 Men Forced to Apologise on Stage for Speaking Out - Oh No They Didn't! 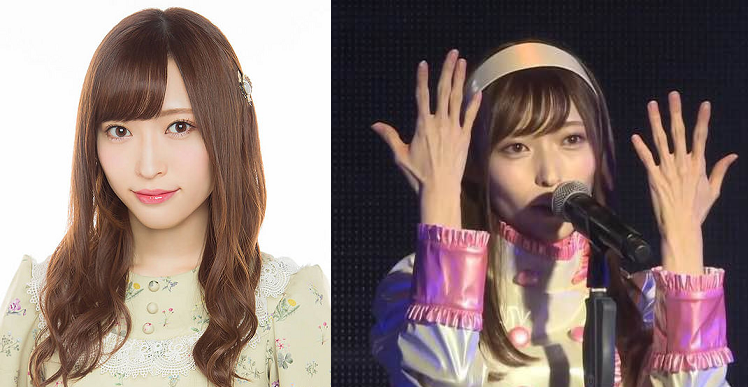 Follow up to yesterday's post about Yamaguchi Maho of Japanese idol group NGT48, who was assaulted a month ago by two men who broke into her apartment, and spoke up a few days ago about the assault on twitter. Yesterday evening, during a concert with the group, she came out on stage and apologised to the fans for speaking out about the assault and "causing trouble". The way that she's apologising, by bowing at a full 90 degree angle, is reserved in Japan for apologising for severe misdeeds and injustices. Keep in mind, she was the one who was assaulted. AKS, the company that NGT48 is under, has finally released an official statement. 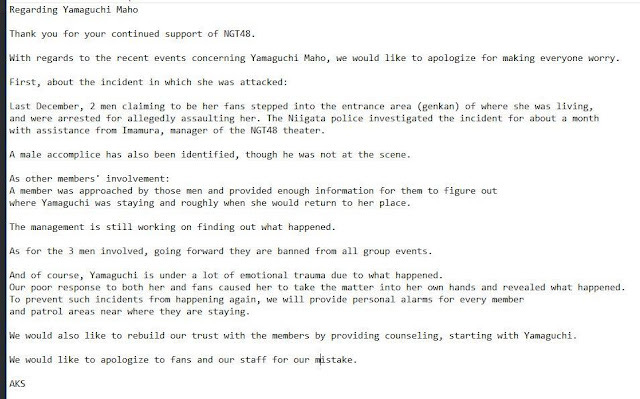 This statement contradicts their previous statement where they implied that there were no other members involved with the incident and basically called Maho a liar. Members and former members of the group have also tweeted about the incident. Yokoyama Yui, AKB48 member and "general director"
"With members' smiles, getting along with everyone, I want to reach for our dreams. We will do our best, so management, please do so too. this is causing a lot of outrage in the jpop community on twitter and it's national news in Japan, but no international outlets have picked up the story yet. the police, the city, and the group management are trying to cover this up. she's lost a ton of weight and is looking absolutely skeletal.